A fabric cleaning system, especially a system for use in the consumer's home, utilizing down the drain detergent composition for a non-aqueous, lipophilic fluid based washing process and automatic laundry machines useful for this process. This application is a continuation of prior co-pending U.S. patent application Ser. No. 10/238,252, filed Sep. 10, 2002; which claims priority to U.S. Provisional Application Ser. No. 60/318,649, filed Sep. 10, 2001; and is a continuation-in-part of co-pending U.S. patent application Ser. No. 10/970,226, filed Oct. 21, 2004, which is a continuation of U.S. patent application Ser. No. 10/738,551, filed Dec. 17, 2003, now U.S. Pat. No. 6,898,951; which is a continuation of U.S. application Ser. No. 09/849,893, filed on May 4, 2001, now U.S. Pat. No. 6,691,536; which claims priority under 35 USC 119(e) to U.S. Provisional Application Ser. No. 60/209,468 filed on Jun. 5, 2000. The present invention relates to a fabric cleaning system, especially a system for use in the consumer's home, utilizing down the drain detergent composition for a non-aqueous solvent based washing process. A non-aqueous solvent based washing system utilizing lipophilic fluid, such as cyclic siloxanes (especially decamethylcyclopentasiloxane, sometimes termed “D5”), particularly for use with washing machines for in-home use, has recently been developed. Such a system is particularly desired for cleaning textile articles without causing damage associated with wet-washing, like shrinkage and dye transfer. To maximize fabric cleaning in such a system it is necessary to use additives for cleaning, softening, finishing, etc. In a typical commercial dry cleaning system, these additives may conveniently be removed from the wash fluid via distillation and disposed of as hazardous waste. However, in the in-home environment (and even in commercial dry-cleaning systems where handling of waste residues is not desired), it is preferred to utilize additives for such a washing system that could be efficiently removed from the wash fluid and disposed safely down the drain. Such a system would free the launderer (at home or in dry cleaning) from concerns over hazardous waste and reduce the amount of hazardous waste in the environment. The present invention is directed to this convenient, environmentally safe system for cleaning fabrics and disposal of cleaning additives. The present invention relates to a washing process using a lipophilic fluid that removes laundry additives and disposes of them safely down the drain with water. The additives are selected from those materials that can safely be disposed down the drain and provide cleaning benefits in the lipophilic fluid. Such additives may include those used in current products for aqueous washing (surfactants, polymers, bleaches, brighteners, perfumes, enzymes, solvents, dyes, etc.) as well as other materials that are soluble or can be suspended in the lipophilic fluid. The features and advantages of such washing process using a lipophilic fluid will become apparent to those of ordinary skill in the art from a reading of the following detailed description and the appended claims. All percentages, ratios and proportions herein are by weight, unless otherwise specified. All temperatures are in degrees Celsius (° C.) unless otherwise specified. All measurements are in SI units unless otherwise specified. All documents cited are in relevant part, incorporated herein by reference. FIG. 1: A Teas diagram for laundry additives soluble in D5 lipophilic fluid having solubility parameters within the circled region. The term “cleaning composition” and/or “treating composition” used herein is intended to mean any lipophilic fluid-containing composition that comes into direct contact with fabric articles to be cleaned. It should be understood that the term encompasses uses other than cleaning, such as conditioning and sizing. The present invention process is described as follows. Detergent (or other products) comprising one or more laundry additives is added to lipophilic fluid either before or after wash fluid contacts fabric articles in need of cleaning in an automatic washing machine. After the wash cycle, fluid is drained from drum of the machine and one or more of the laundry additives are separated from lipophilic fluid. Preferred mode of separation is extraction of additives into a water phase that is introduced during the process of purifying the lipophilic fluid for reuse by the machine. As such water can be added during to separation step to enhance the extraction of additives and other contamninants. Together with the water one can add “extraction aids” such as hydrotopes and emulsifiers. A preferred hydrotrope is a short chain, low ethoxylated nonionic such as Dehydol™. Other modes of separation are filtration, coalescence, adsorption, centrifugation, and distillation. Removal of laundry additives is such that the lipophilic fluid is sufficiently clean of laundry additives and soil contaminants that it is ready for use with next load of fabric to be cleaned, and the water phase (to be drained) containing laundry additives (and likely also some of the soil removed from the fabrics) is substantially free of lipophilic fluid. Methods for cleaning fabric articles according to the present invention include those wherein water is added to the cleaning composition wash medium. The present invention methods also include processes wherein one or more of the laundry additives are removed by filtration and the filter used for this filtration is subsequently flushed with water to mix with the laundry additives removed from the lipophilic fluid. The aqueous mixture thus formed is then disposed of down the drain. It is also to be understood that the present invention process encompasses methods wherein only part of the laundry additives are disposed of down the drain and while another part of the laundry additives is removed by a disposable filter (this disposable filter may then be removed from the machine for recycling of the collected laundry additives and/or the filter, or may be disposed of by conventional means such as to a landfill). An automatic washing machine useful according to the present invention is any machine designed to clean fabrics with a wash medium containing lipophilic fluid and laundry additives. While the machine will typically have a rotating drum capable of contacting the lipophilic fluid and laundry additives with the fabrics to be cleaned, for purposes of this invention any method for contacting the lipophilic fluid and laundry additives with the fabric is envisioned, obviously as long as such contact permits the cleaning process to occur. Such machines must comprise a connection for supplying lipophilic fluid (alone or with laundry additives already mixed therewith) into a chamber for contacting the fabric articles to be cleaned with the lipophilic fluid. Preferred machines also comprise a storage chamber for storing the lipophilic fluid to be supplied to the wash process carried out in the machine. Thus, these machines typically have a source of lipophilic fluid. The machines also comprise a separation system capable of separating the lipophilic fluid from laundry additives during or after the fabric cleaning process in order to reuse the lipophilic fluid. Further the present invention machines comprise a connection for attachment to an aqueous waste removal system such that at least some (preferably all) of the laundry additives removed by the separation system are disposed of down the drain. Preferred machines also have a connection for attachment to a source of water, typically tap water. “Substantially free of lipophilic fluid”, as used herein, means that the aqueous mixture to be disposed of down the drain does not contain unacceptably high levels of lipophilic fluid as determined by both environmental safety and cost of replacement of the lost lipophilic fluid from the washing machine store of lipophilic fluid. Since it is highly desireable that essentially all the lipophilic fluid be reused in the current wash system, it is highly desireable that very little if any of the lipophilic fluid is disposed of down the drain with the above-noted aqueous phase containing laundry additives. A preferred group of non-aqueous lipophilic fluids suitable for incorporation as a major component of the compositions of the present invention include low-volatility nonfluorinated organics, silicones, especially those other than amino functional silicones, and mixtures thereof. Low volatility nonfluorinated organics include for example OLEAN® and other polyol esters, or certain relatively nonvolatile biodegradable mid-chain branched petroleum fractions. Another preferred group of non-aqueous lipophilic fluids suitable for incorporation as a major component of the compositions of the present invention include, but are not limited to, glycol ethers, for example propylene glycol methyl ether, propylene glycol n-propyl ether, propylene glycol t-butyl ether, propylene glycol n-butyl ether, dipropylene glycol methyl ether, dipropylene glycol n-propyl ether, dipropylene glycol t-butyl ether, dipropylene glycol n-butyl ether, tripropylene glycol methyl ether, tripropylene glycol n-propyl ether, tripropylene glycol t-butyl ether, tripropylene glycol n-butyl ether. Suitable silicones for use as a major component, e.g., more than 50%, of the composition include cyclic siloxane such as “D5” and/or linear analogs having approximately similar volatility, optionally complemented by other compatible silicones. Suitable silicones are well known in the literature, see, for example, Kirk Othmer's Encyclopedia of Chemical Technology, and are available from a number of commercial sources, including General Electric, Toshiba Silicone, Bayer, and Dow Corning. Other suitable lipophilic fluids are commercially available from Procter & Gamble or from Dow Chemical and other suppliers. Any non-aqueous fluid that is both capable of meeting known requirements for a dry-cleaning fluid (e.g, flash point etc.) and is capable of at least partially dissolving sebum, as indicated by the test method described below, is suitable as a lipophilic fluid herein. As a general guideline, perfluorobutylamine (Fluorinert FC-43®) on its own (with or without adjuncts) is a reference material which by definition is unsuitable as a lipophilic fluid for use herein (it is essentially a nonsolvent) while D5 have suitable sebum-dissolving properties and dissolves sebum. Prepare three vials, each vial will contain one type of lipophilic soil. Place 1.0 g of canola oil in the first; in a second vial place 1.0 g of the oleic acid (95%), and in a third and final vial place 1.0 g of the squalene (99.9%). To each vial add 1 g of the fluid to be tested for lipophilicity. Separately mix at room temperature and pressure each vial containing the lipophilic soil and the fluid to be tested for 20 seconds on a standard vortex mixer at maximum setting. Place vials on the bench and allow to settle for 15 minutes at room temperature and pressure. If, upon standing, a clear single phase is formed in any of the vials containing lipophilic soils, then the non-aqueous fluid qualifies as suitable for use as a “lipophilic fluid” in accordance with the present invention. However, if two or more separate layers are formed in all three vials, then the amount of non-aqueous fluid dissolved in the oil phase will need to be further determined before rejecting or accepting the non-aqueous fluid as qualified. The level of lipophilic fluid, when present in the consumable fabric article treating/cleaning compositions according to the present invention, is preferably from about 0.1% to about 90%, more preferably from about 0.5% to about 75%, and even more preferably from about 1% to about 50% by weight of the consumable fabric article treating/cleaning composition. Detergent compositions useful herein comprise laundry additives. “Laundry additives” as used herein, means additives useful in a lipophilic fluid-based cleaning system selected from those materials that can be safely disposed down the drain within all constraints on environmental fate and toxicity (e.g. biodegradability, aquatic toxicity, pH, etc.). Although solubility in water or lipophilic fluid are not necessarily required, preferred materials are simultaneously soluble in both water and lipophilic fluid. Examples of such laundry additives are those that have solubility parameters that fall within the circled region on the Teas diagram provided in FIG. 1. The laundry additives can vary widely and can be used at widely ranging levels. Examples of the types of siloxane-based surfactants described herein above may. be found in EP-1,043,443A1, EP-1,041,189 and WO-01/34,706 (all to GE Silicones) and U.S. Pat. No. 5,676,705, U.S. Pat. No. 5,683,977, U.S. Pat. No. 5,683,473, and EP-1,092,803A1 (all to Lever Brothers). Nonlimiting commercially available examples of suitable siloxane-based surfactants are TSF 4446® (ex. General Electric Silicones), XS69-B5476® (ex. General Electric Silicones); Jenamine HSX® (ex. DelCon) and Y12147® (ex. OSi Specialties). The non-silicone additive (i.e., materials do not contain a Si atom), when present, which preferably comprises a strongly polar and/or hydrogen-bonding head group, further enhances soil removal by the compositions of the present invention. Examples of the strongly polar and/or hydrogen-bonding head group-containing materials include, but are not limited to alcohols, cationic materials such as cationic surfactants, quaternary surfactants, quaternary ammonium salts such as ammonium chlorides (nonlimiting examples of ammonium chlorides are Arquad® materials commercially available from Akzo Nobel) and cationic fabric softening actives, nonionic materials such as nonionic surfactants (i.e., alcohol ethoxylates, polyhydroxy fatty acid amides), gemini surfactants, anionic surfactants, zwitterionic surfactants, carboxylic acids, sulfates, sulphonates, phosphates, phosphonates, and nitrogen containing materials. In one embodiment, non-silicone additives comprise nitrogen containing materials selected from the group consisting of primary, secondary and tertiary amines, diamines, triamines, ethoxylated amines, amine oxides, amides and betaines, a nonlimiting example of a betaines is Schercotaine® materials commercially available from Scher Chemicals and mixtures thereof. In yet another embodiment, primary alkylamines comprising from about 6 to about 22 carbon atoms are used. Particularly preferred primary alkylamines are oleylamine (commercially available from Akzo under the trade name Armeen OLD®), dodecylamine (commercially available from Akzo under the trade name Armeen 12D®), branched C16-C22 alkylamine (commercially available from Rohm & Haas under the trade name Primene JM-T®) and mixtures thereof. Suitable cationic materials may include quaternary surfactants, which maybe quaternary ammonium compounds. Commercially available agents include Varisoft® materials from Goldschmidt. Additional suitable cationic materials may include conventional fabric softening actives. 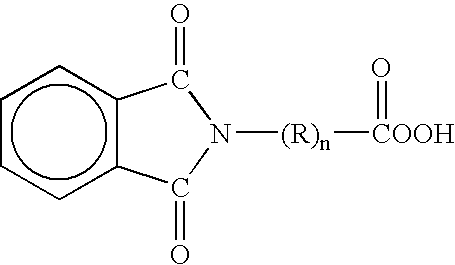 wherein R1 is C8-16 alkyl, each of R2, R3 and R4 is independently C1-C4 alkyl, C1-C4 hydroxy alkyl, benzyl, and —(C2H40)xH where x has a value from 2 to 5, and X is an anion. Not more than one of R2, R3 or R4 should be benzyl. Especially preferred are alkyl ethoxylate surfactants with each R8 being C8-16 straight chain and/or branch chain alkyl and the number of ethyleneoxy groups s being from about 2 to about 6, preferably from about 2 to about 4, more preferably with R8 being C8-15 alkyl and s being from about 2.25 to about 3.5. These nonionic surfactants are characterized by an HLB of from 6 to about 11, preferably from about 6.5 to about 9.5, and more preferably from about 7 to about 9. Nonlimiting examples of commercially available preferred surfactants are Neodol 91-2.5® (C9-10, s=2.7, HLB=8.5), Neodol 23-3 (C12-13, s=2.9, HLB=7.9) and Neodol 25-3® (C12-15, s=2.8, HLB=7.5). Further nonlimiting examples include nonionic surfactants selected from the group consisting of fatty acid (C12-18) esters of ethoxylated (EO5-100) sorbitans. More preferably said surfactant is selected from the group consisting of mixtures of laurate esters of sorbitol and sorbitol anhydrides; mixtures of stearate esters of sorbitol and sorbitol anhydrides; and mixtures of oleate esters of sorbitol and sorbitol anhydrides. Even more preferably said surfactant is selected from the group consisting of Polysorbate 20®, which is a mixture of laurate esters of sorbitol and sorbitol anhydrides consisting predominantly of the monoester, condensed with about 20 moles of ethylene oxide; Polysorbate 60® which is a mixture of stearate esters of sorbitol and sorbitol anhydride, consisting predominantly of the monoester, condensed with about 20 moles of ethylene oxide; Polysorbate 80® which is a mixture of oleate esters of sorbitol and sorbitol anhydrides, consisting predominantly of the monoester, condensed with about 20 moles of ethylene oxide; and mixtures thereof. Most preferably, said surfactant is Polysorbate 60®. In one embodiment, the anionic surfactants include alkyl alkoxylated sulfate surfactants hereof are water soluble salts or acids of the formula RO(A)mSO3M wherein R is an unsubstituted C10-C24 alkyl or hydroxyalkyl group having a C1--C24 alkyl component, preferably a C12-C20 alkyl or hydroxyalkyl, more preferably C12-C18 alkyl or hydroxyalkyl, A is an ethoxy or propoxy unit, m is greater than zero, typically between about 0.5 and about 6, more preferably between about 0.5 and about 3, and M is H or a cation which can be, for example, a metal cation (e.g., sodium, potassium, lithium, calcium, magnesium, etc. ), ammonium or substituted-ammonium cation. Alkyl ethoxylated sulfates as well as alkyl propoxylated sulfates are contemplated herein. The non-silicone additive, when present in the fabric article treating compositions of the present invention, preferably comprises from about 0.001% to about 10%, more preferably from about 0.02% to about 5%, even more preferably from about 0.05% to about 2% by weight of the fabric article treating composition. Compositions according to the present invention may further comprise a polar solvent. Non-limiting examples of polar solvents include: water, alcohols, glycols, polyglycols, ethers, carbonates, dibasic esters, ketones, other oxygenated solvents, and mixutures thereof. Further examples of alcohols include: C1-C126 alcohols, such as propanol, ethanol, isopropyl alcohol, etc . . . , benzyl alcohol, and diols such as 1,2-hexanediol. The Dowanol® series by Dow Chemical are examples of glycols and polyglycols useful in the present invention, such as Dowanol® TPM, TPnP, DPnB, DPnP, TPnB, PPh, DPM, DPMA, DB, and others. Further examples include propylene glycol, butylene glycol, polybutylene glycol and more hydrophobic glycols. Examples of carbonate solvents are ethylene, propylene and butylene carbonantes such as those available under the Jeffsol tradename. Polar solvents for the present invention can be further identified through their dispersive (δD), polar (δP) and hydrogen bonding (δH) Hansen solubility parameters. Preferred polar solvents or polar solvent mixtures have fractional polar (fP) and fractional hydrogen bonding (fH) values of fP>0.02 and fH>0.10, where fP=δP/(δD+δP+δH) and fH=δH/(δD+δP+δH) more preferably fP>0.05 and fH>0.20, and most preferably fP>0.07 and fH>0.30. The compositions of the present invention may optionally further comprise one or more cleaning adjuncts. The optional cleaning adjuncts can vary widely and can be used at widely ranging levels. For example, detersive enzymes such as proteases, amylases, cellulases, lipases and the like as well as bleach catalysts including the macrocyclic types having manganese or similar transition metals all useful in laundry and cleaning products can be used herein at very low, or less commonly, higher levels. Cleaning adjuncts that are catalytic, for example enzymes, can be used in “forward” or “reverse” modes, a discovery independently useful from the fabric treating methods of the present invention. For example, a lipolase or other hydrolase may be used, optionally in the presence of alcohols as cleaning adjuncts, to convert fatty acids to esters, thereby increasing their solubility in the lipohilic fluid. This is a “reverse” operation, in contrast with the normal use of this hydrolase in water to convert a less water-soluble fatty ester to a more water-soluble material. In any event, any cleaning adjunct must be suitable for use in combination with a lipophilic fluid in accordance with the present invention. Nonlimiting examples of finishing polymers that are commercially available are: polyvinylpyrrolidone/dimethylaminoethyl methacrylate copolymer, such as Copolymer 958®, molecular weight of about 100,000 and Copolymer 937, molecular weight of about 1,000,000, available from GAF Chemicals Corporation; adipic acid/dimethylaminohydroxypropyl diethylenetriamine copolymer, such as Cartaretin F-4® and F-23, available from Sandoz Chemicals Corporation; methacryloyl ethyl betaine/methacrylates copolymer, such as Diaformer Z SM®, available from Mitsubishi Chemicals Corporation; polyvinyl alcohol copolymer resin, such as Vinex 2019®, available from Air Products and Chemicals or Moweol®, available from Clariant; adipic acid/epoxypropyl diethylenetriamine copolymer, such as Delsette 101®, available from Hercules Incorporated; polyamine resins, such as Cypro 515®, available from Cytec Industries; polyquaternary amine resins, such as Kymene 557H®, available from Hercules Incorporated; and polyvinylpyrrolidone/acrylic acid, such as Sokalan EG 310®, available from BASF. disposing of this water phase comprising water, laundry additives and soils down the drain. 2. The method for cleaning fabric articles according to claim 1 wherein the lipophilic fluid comprises D5 and the laundry additives comprise one or more additives selected from the group consisting of surfactants, alkyl amines, and combinations thereof. 3. The method for cleaning fabric articles according to claim 1 wherein a hydrotrope is added to the water. 4. The method for cleaning fabric articles according to claim 3 wherein the hydrotrope is a short chain ethoxylated nonionic surfactant. 5. The method for cleaning fabric articles according to claim 1 further comprising the steps of removing one or more of the laundry additives from the lipophilic fluid by filtration and subsequently flushing filter used for this filtration with water thereby forming an aqueous mixture comprising water and the laundry additives removed from the lipophilic fluid, followed by disposing of this aqueous mixture down the drain. 6. The method for cleaning fabric articles according to claim 1 wherein only part of the laundry additives are disposed of down the drain and another part of the laundry additives is removed by a disposable filter. 7. The method for cleaning fabric articles according to claim 1 wherein the laundry additives are selected from the group consisting of builders, surfactants, enzymes, bleach activators, bleach catalysts, bleach boosters, bleaches, alkalinity sources, antibacterial agents, colorants, perfumes, pro-perfumes, finishing aids, lime soap dispersants, odor control agents, odor neutralizers, polymeric dye transfer inhibiting agents, crystal growth inhibitors, photobleaches, heavy metal ion sequestrants, anti-tarnishing agents, anti-microbial agents, anti-oxidants, anti-redeposition agents, soil release polymers, electrolytes, pH modifiers, thickeners, abrasives, divalent or trivalent ions, metal ion salts, enzyme stabilizers, corrosion inhibitors, diamines or polyamines and/or their alkoxylates, suds stabilizing polymers, solvents, process aids, fabric softening agents, optical brighteners, hydrotropes, suds or foam suppressors, suds or foam boosters and mixtures thereof. 8. The method for cleaning fabric articles according to claim 1 wherein the soils are selected from the group consisting of beverages, food soils, water soluble dyes, bodily fluids, outdoor soils, and mixtures thereof.